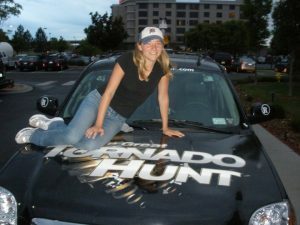 After 10 years chasing tornadoes – both in person and from the newsroom – as a TV producer and then digital/social senior editor at The Weather Channel, you reach a point where you can’t let Mother Nature call the shots anymore. Only Mother Nature knows when it’ll trigger an earthquake that sets off a nearly world-wide tsunami, or exactly when she’s going to unleash more than 300 reported tornadoes in a 3-day timespan across a 3200-mile path. It was a job that fascinated me and humbled me. It was a job that inspired me and gave me purpose because there were truly days when you’re saving lives through information or helping families cope with a loss by telling their story. It was a job where storm victims would hug you and thank you because you were wearing the brand’s logo on your rain jacket. But it was also a job full of the unexpected. Even when forecasts are accurate, there’s still no telling exactly what the full impacts would be and where they would the worst and how many people would have their lives turned upside down. Ten years of preparing for the unexpected can drain your energy. But what could I do that still inspired me, that gave me purpose and help people? When I fall for something – like the Beatles at age 16 and Springsteen when I was 28 – I fall hard. As I met brewers and realized so many of them had walked away from their big corporate jobs or found that running a brewery helped them connect with their communities, I was inspired. These women and men were small business owners who happened to be running beer businesses –and a new obsession began. I started a second Twitter account (@craftcurious) devoted to beer, not wanting to confuse all the people who followed me for weather updates on the other Twitter account. During a beercation, that Twitter account helped me get noticed by a Colorado-based craft beer blog that needed a Southeast Editor. 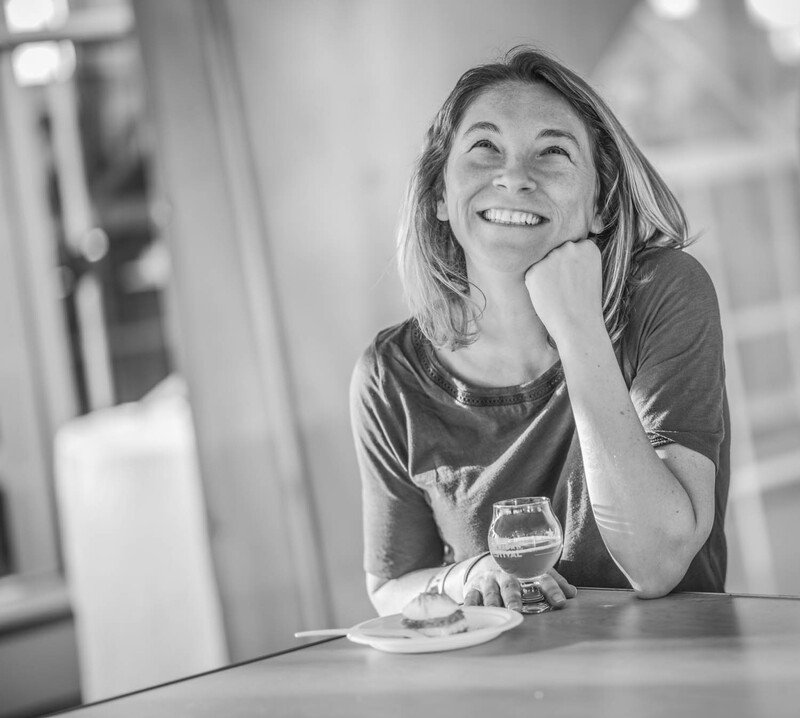 I took the job, knowing it was unpaid, because I needed to write about these brewers who fascinated and inspired me. I knew someday I wanted to take what I loved doing – storytelling and social media – and do it for an independent brewery. I had no idea someday would come a lot sooner than I planned. 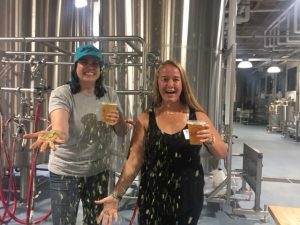 When the Brewers Association posted a job looking for an Editor-in-Chief of its beer-lover facing website CraftBeer.com, I applied thinking it was a longshot. But I got the job, and since May 2016, I’ve been working with writers and video producers across the U.S. to tell the stories about the people who are the heartbeat of American craft brewing, as well as the cities and businesses that support them. 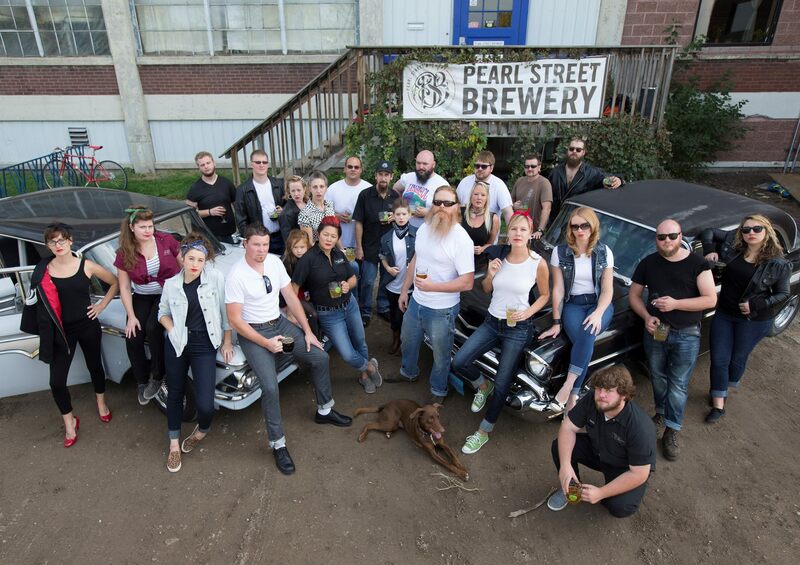 For us at CraftBeer.com, it’s not about the beer – it’s about the people. 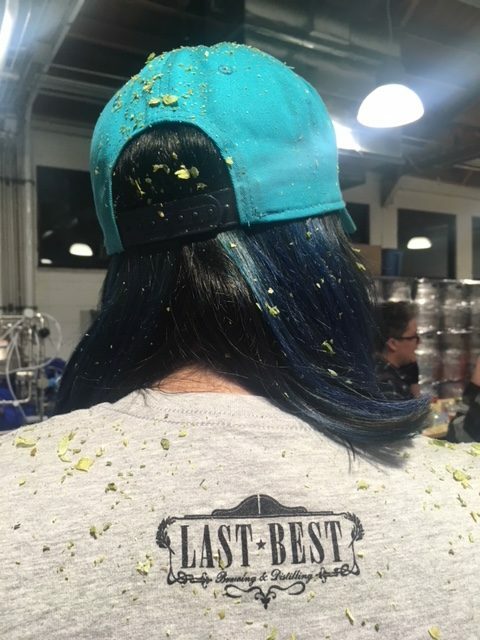 My colleague Andy Sparhawk said it best in a recent article: “Don’t just taste your beer, believe in it.” And for us, that’s believing in the people behind it. Cheers to America’s small and independent brewers and the beer lovers who make it all possible. I write about the culture of craft beer for the Milwaukee Journal Sentinel newspaper. I was a general assignment reporter in Milwaukee, Wisconsin, which meant I could write about anything editors asked from stories about an overnight children’s shelter to spending 24 hours at a casino. Then I accepted a challenge to write about issues important to women — “Lean In” was big at the time. Why not? I’m a woman. I’m all for parity. The first story I wrote was about women and beer. 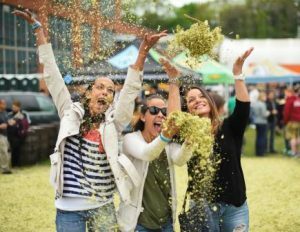 I wrote about how women are a fast-growing component of craft beer’s growth. And then I wrote about beer again. And again. I wasn’t a big beer drinker at the time and I didn’t know what I didn’t know. 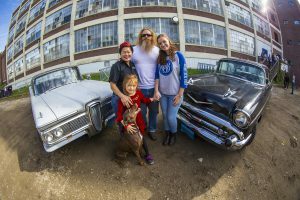 The women of Milwaukee’s Barley’s Angels group helped me out. The first story wasn’t so far off track from the original assignment. I found that plenty of women knew about beer; several worked in the industry; and others were more-than-competent home brewers. And yet bartenders would still automatically hand over the wine list when they sat at the bar. Or offer unsolicited advice on fruit beers they might like. The year was 2013. There were nine breweries and brewpubs in Milwaukee. Today, there are 31. Two more are expected to open this summer. It was dumb luck timing for me. It became an opportunity to witness a new wave of Milwaukee’s craft brewery growth from the ground up. This growth spurt is great news for Milwaukee. Not since the 1960s and ‘70s, when Schlitz, Pabst, Blatz and Miller ruled the nation’s beer supply has beer been a centerpiece for the city. I don’t cover beer for beer geeks. I cover it for people like me who like beer and get excited by the endless possibilities. It’s amazing to consider that most beers use the same ingredients but they can taste completely different. I remember the night I realized that I had intentionally switched from a wine lover to a beer lover. I was with a friend at Sugar Maple. My friend and I spent years sipping wines and talking about what we liked about them. We ordered a flight at Sugar Maple. We couldn’t help it. We did the same thing. We sniffed. We compared. What does this taste like to you? This one tastes too sweet? This was our wine conversation but now it was about beer. the time) to the southern border of Wisconsin’s Driftless region where Deb Carey, founder and president of New Glarus Brewing, spent an afternoon showing me the brewery and the new canning line. Sometimes I just went to breweries like a tourist — occasionally as many as five in one day. They use the same ingredients but each brewery is as unique as the people behind it. Some, like Bloomer Brewing in Bloomer, Wis., served as the neighborhood bar — a place where at least one day a week people came together for beer brewed with original and historic recipes and tacos served from a card table covered in a plastic tablecloth. I didn’t like the beer at Kozy Yak in Amherst as much as I hoped to but I did like the feeling that I was in someone’s living room and the hosts were happy to see me. I have the best “What I did on my summer vacation” story ever. More than that, I had motivation to continue to write about craft beer. I joined the Pink Boots Society in 2016, after I felt seasoned enough to feel like beer really was my job. The summertime tour, along with these four years of reporting on beer in Wisconsin, has taught me that the state’s brewers are a committed brunch who build community by working with each other instead of against each other. Sprecher Brewing and Lakefront Brewing brought craft beer to Milwaukee in the 1980s. They see the current craft movement as momentum instead of competition. There’s a Milwaukee Craft Beer League to spotlight beer in our city. And there’s me. I’m a soon to be a published author. About beer. Go figure. Kathy Flanigan is a reporter for the features and entertainment section of the Milwaukee Journal Sentinel. She’s been a journalist since 1978 covering subjects from how to deal with Southern California traffic to life in the Atlanta suburbs. She lives in Wauwatosa, WI with her husband, Duane, and her dog, Jack. 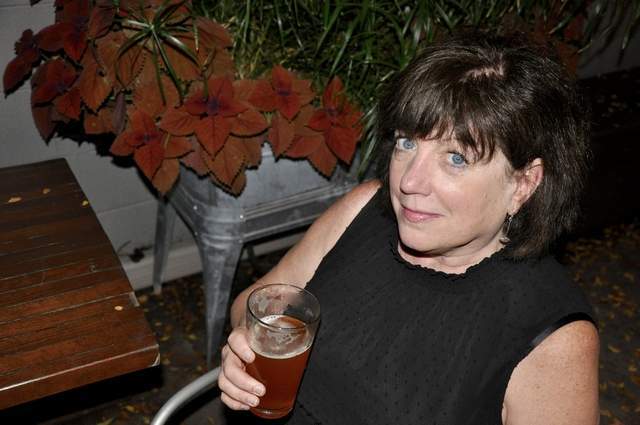 In addition to her daytime job, she is on a book tour for Beer Lover’s Wisconsin. What do craft brewing and history museums have in common? 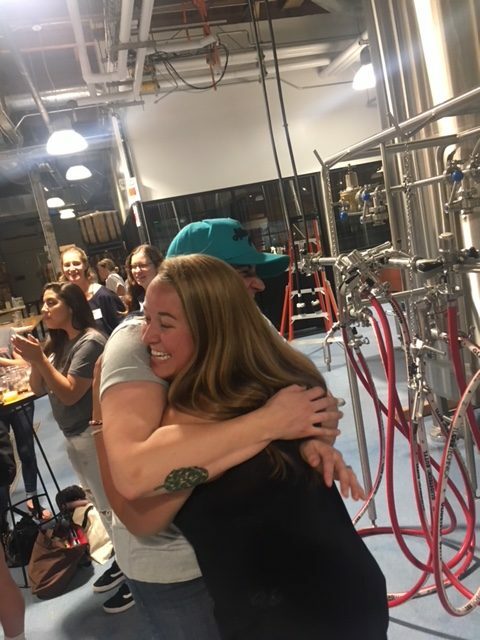 In my experiences working in both fields, I have learned that if you focus on your audience, whether they are beer drinkers, history lovers, or both, you can make personal connections with individuals that will stick with them forever. I am currently the Director of Programs at the Smithsonian’s National Museum of American History, and as part of my job, I direct programming related to food history at the museum. We use food, from cooking demonstrations to exhibitions to collections to brewing history, to help audiences connect personal with history. Food in museums is about seeing yourself in the story and understanding how you are making history today. But before I came to museum-land, I spent 4 years working in the craft brewing industry, in the Marketing Department of Magic Hat Brewing Company in South Burlington, Vermont. I ran brewery events, onsite and offsite, and managed public relations for the brewery. Now this was 10 years ago, so times have definitely changed with that company and with the whole industry, but many of the things I learned there continue to influence the work I do now. When the National Museum of American History decided to launch an evening program series, we started with beer history. From my time in the world of beer, I knew that beer fans were curious, interested, and wanted to learn…all things that we wanted in a museum audience. 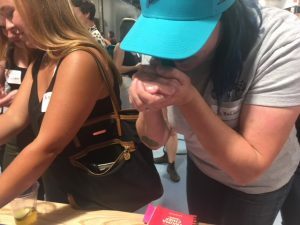 For the first event, we brought together a brewer and a historian to talk about the history of American brewing, served amazing beers, and put objects on display from the museum collections related to brewing history. It was a huge hit, and the audience started asking for more. After learning that our audiences were interested in this topic, our curatorial and archival teams surveyed the museum’s collections and found that the museum had a robust collection of American brewing history from the late 19th and early 20th century, but very little from the post 1960s craft brewing era. Not only did we have a gap in the collections during an important time period in brewing history, we also knew that brewing history topics were connected to larger themes in American history during the second half of the 20th century. In 2016, the museum launched the American Brewing History Initiative, a three year project, generously supported by the Brewers Association, to collect, document, and preserve the history of brewing, craft brewers, and the beer industry – with the goal to explore how beer and beer history connect to larger themes of American history. In 2017, after a nation-wide search and lots of press attention, the museum hired historian Dr. Theresa McCulla to lead the research initiative. With this beer story, we realized, we were really on to something. If you start with a topic that people clearly already have an interest in, you have the ability to go beyond what they think they know and encourage them to think differently about the world around them. Imagine if every time you drink a beer, you think about how connected you are to the history of this country…to the enslaved people and women who brewed beer in the 1780s, to the German immigrants in the Midwest in the 1850s, and to today’s craft brewers. You are part of history. And your beer helps you see yourself that way. When we listened to our audiences, we were able to build something that is both popular and historically relevant. And we plan to continue the work of documenting brewing history at the National Museum of American History for years to come. Pints, Parenting and Play –>Juggling. It. All. Today as I spend what is probably my umpteenth beautiful Saturday morning and afternoon holed up in my office, ignoring the perfect 80 degree day with zero humidity (a summer gift in this usually highly humid region of the Midwest), I’m reminded of the dedication it takes to do what we do. As an owner of a brewery, but more importantly a small business, I often miss those moments, those opportunities, the things I love most, to DO what I love the most… sell beer! And that’s ok. It’s not always ok. But for the most part, it’s ok. But I’m trying really hard to find some balance between business and pleasure. The great thing is… lots of the time, my time is both. Yesterday, I spent the evening in Wisconsin Dells, listening to live local music and sipping on a session IPA we brewed especially for this touristy local hot spot we were hanging out at. And they took the entire 20 BBL batch. Not bad for a day’s work… and play. When my schedule allows for it, I travel around Wisconsin for the Wisconsin Humanities Council’s Working Lives Project to talk about my experience being a woman in a male dominated field. I talk about my start in the industry 14 years ago, when I was unemployed, closing my restaurant after two years of giving it a go and going through bankruptcy. I started to help out my “boyfriend” aka. The Brewmaster go around to bars in La Crosse taking keg orders one day a week for his small nano brewery. It was great. Back then, a big week was a 10 1/2 BBL deliveries for the week. The next day, Joe would load up our blue short bus that we got practically for FREE but the only thing we could afford and he’d deliver the kegs and I’d write the invoices. Back then, I was one of the only woman beer, liquor or wine sales working the route. So I got a lot of attention. Was told that I was a refreshing change from those “scraggly men” who come around. I’m not aware of using my feminine wiles to sell beer, but unconsciously… maybe I did. I grew our local sales fairly quickly, and within a few years I was going out daily and we had to hire a full time delivery guy. But even after a few years of selling beer, I couldn’t say it was my passion. I was still “helping” out. Fully planning on pursuing my plans in life. I couldn’t tell you what day that mentality changed. When I realized I WAS doing something awesome. I was pursuing my plans for my life. But it did. And after that… I was in it to win it. The past few years have been a whirlwind. We’ve posted double digit growth every year for 18 years and the past two years we’ve posted over 25% growth and are on pace to hit 40% growth for this year. All this talk of growth and we’re still one of the smallest production breweries in Wisconsin. We fund all of our own growth ourselves, so we only grow as we can afford to. Now, we’ve got to learn how to grow as we can manage to. We’ve hired 6 full-time employees in the last year and have grown our staff from 10 to 25+ including part-time beertenders. And not being one to pass up any opportunities, we opened a print and design company four years ago to cut down on our own design and print costs, and to grow a separate independent company. All of these things are great things. My point I’m making today, as a woman and as a human being, it is a constant juggling act to figure out how to keep growing, how to keep the creativity up, how to manage the many men and women that work tirelessly alongside of us and how to keep my little family health and happy. Is it because I can’t say I can’t, that I feel the need to talk about how difficult it is to keep all this together? I don’t think so. But somehow through the culture of society, it has become a mandate that we can as women do it all. And I believe we can! But I’ve also learned it will be hard. But it is the passion and the determination that propels us into each day and into each endeavor. I wouldn’t want it any other way. And I think I’m doing alright. And I’ll admit it. I can’t juggle at all. Cheers to the ladies that keep this industry exciting, interesting and evolving… all while being the foundation of their families! Tami Plourde is a Minnesota native and longtime La Crosse, Wisconsin resident. She opened her first business venture, a restaurant in downtown La Crosse, in 2001, which she operated for two years. 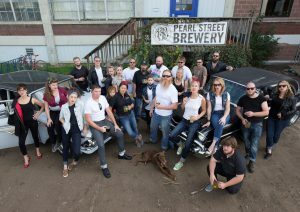 After that, she partnered with Joe Katchever to run and operate Pearl Street Brewery. 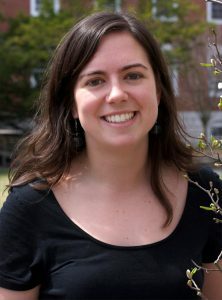 She is currently a partner and the Director of Marketing and Sales for Pearl Street Brewery. And in her time in this position has helped the company grow from a small 500 BBL producing beer business to one that produced over 3500 BBL in 2015. In 2016, she helped oversee a 28% growth to get to almost 4500 BBLS and in 2017, is on pace for a 40% growth of just shy of 6500 BBLS. She is currently overseeing an expansion project. She works with sales staff, self-distribution staff, directly with distributors, marketing staff and production staff. 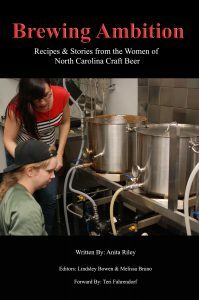 I’m very excited to be able to share with other Pink Boots Society members about the book that I was able to write with the help of over 35 women in North Carolina’s Craft Beer Industry. Brewing Ambition is a collection of homebrew recipes that were donated by members of the Pink Boots Society from across the state of North Carolina and the stories of the women that submitted recipes. Each of these women is an amazing source of inspiration for me every day. It is humbling that they have trusted me to share who they are with the reader. Brewing Ambition began from a brainstorming session. Caroline Parnin, our state chapter leader, reached out to all of the members she had contact information for asking for fundraising ideas. We knew that we wanted to have a serious impact, and we each had our own ideas about how we could help. In 2014, I was a beer buyer for Metro Wines in Asheville, NC while I was pursuing my education in Brewing, Distillation, and Fermentation at Asheville-Buncombe Technical Community College’s Craft Beverage Institute of the Southeast. I had just finished my first semester of classes and my first few months of working at Metro Wines when my boss, Gina Trippi, asked if I could write some sort of content for the store’s web page. She wanted content that would keep our customers engaged and help with web search optimization. I had been a closeted writer since I was in grade school, so I agreed. 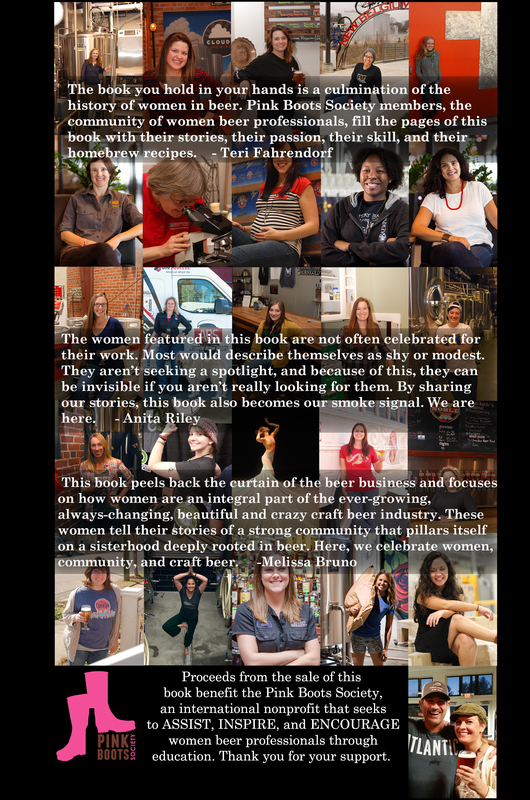 We needed a topic for the blog, and Gina asked if I would be interested in writing about women in the beer industry. I thought, “Sure. No one is going to read that, but if that’s what you want, it will be fun for me to write.” We decided to name it Brewing Up a Storm after a sixteenth century painting of a brewster wrecking a ship at sea. A few months later, I added a monthly column in WNC Woman Magazine. Then Asheville Grit, an online publication that focuses on local culture, events, food, and beverage, asked if I would write for them. I’m astounded at how much interest there is around women in beer! I’m equally surprised at how many women there are in this industry. When I began my studies, I thought I would be the only woman in the program. There were actually three women out of the 24 chosen for the limited seating class. I’ve been writing about women in North Carolina for three years now. I haven’t left the state yet, and I haven’t run out of women in the industry that I want to write about! When Caroline asked what ideas we had for fundraising for Pink Boots, writing a book was my first instinct. The mission of this book has become multifaceted. Obviously, I set out to raise funds for Pink Boots scholarships. I also wanted to raise awareness of Pink Boots within the beer community. As I approached women to be part of this project, I explained to them why I was writing the book and where the money would go. Many of them heard about Pink Boots for the first time during these conversations. I also wanted to reach outside our membership for the funds. By doing so I became a de facto ambassador for Pink Boots. 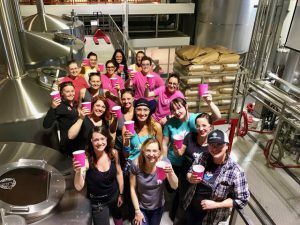 The book is a homebrew recipe book specifically so that it can help raise awareness of Pink Boots and women beer professionals. By making the recipes all 5 gallon batch sizes, we are targeting an audience of homebrewers that may not realize that their hobby is a viable career option for them. To further that message, I made sure to include women with as many different roles within the industry as I could. 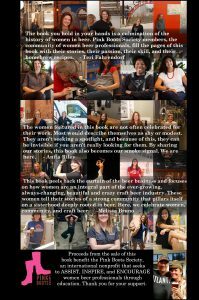 There are several brewers and production employees featured in the book, but many of the women work in marketing, sales, distribution, taproom management, brewers’ guilds, labs, etc. I even included a lawyer that specializes in intellectual property law for breweries and a seven year old girl whose parents are brewery owners. When you set out on such an undertaking, you never know if it will be successful or not. I was ok with the notion that no one would be interested except me. I had decided early on that if I only sold one copy, that this was a worthwhile project for self-fulfillment if nothing else. That certainly has not been the case, though! I was absolutely shocked when I received an email from Teri Fahrendorf saying that she had been asked by the board members of PBS to write the forward for the book! I still get goosebumps and a little teary-eyed when I read the powerful forward she wrote. We launched the book at the Biere de Femme Festival in Shelby, NC in March of 2017. 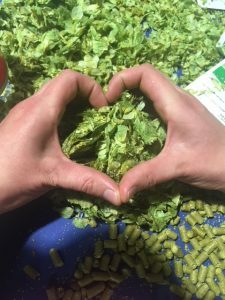 I’m in the promotion phase now, and being able to see the consumer response as well as the industry support for Brewing Ambition has been overwhelming. I had three book signing events in one week, and I was thrilled to see the same woman at all three events. She shared with me that she has since enrolled at her local community college to begin brewing classes this June! 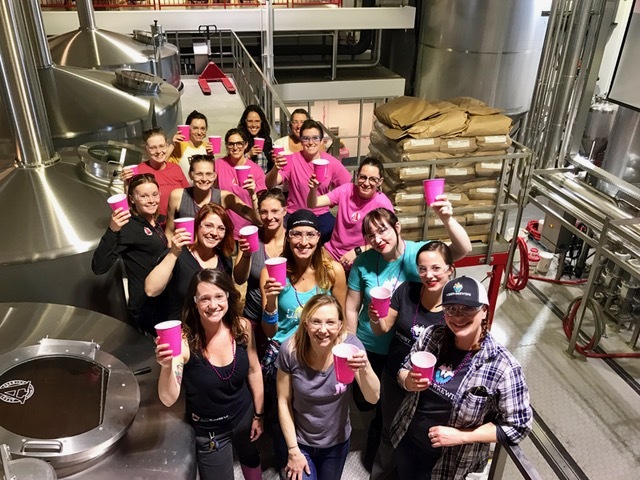 I’m also excited to see that men are just as interested in supporting Pink Boots and reading about the women that make their favorite beers possible as the women are! 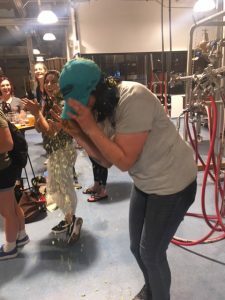 Many of the women featured in the book have hosted book signing events, shared the link to purchase the book online through their own social media, and bought books to sell at their breweries, homebrew shops, and bottle shops. So far, we have sold 340 copies of Brewing Ambition. My fundraising goal is $5,000 by the end of 2017. There are five community colleges in North Carolina that are currently offering brewing education: A-B Tech in Asheville, Blue Ridge Community College in Hendersonville, Rockingham Community College in Reidsville, Wake Tech in Raleigh, and Nash Community College in Rocky Mount. $5,000 is enough to help one woman in each of these programs attend school for one year. These programs offer a variety of focuses and locations across our state at a price that is accessible to many people. Having received scholarships myself, I know exactly how much they can impact whether someone is able to attend school or not. 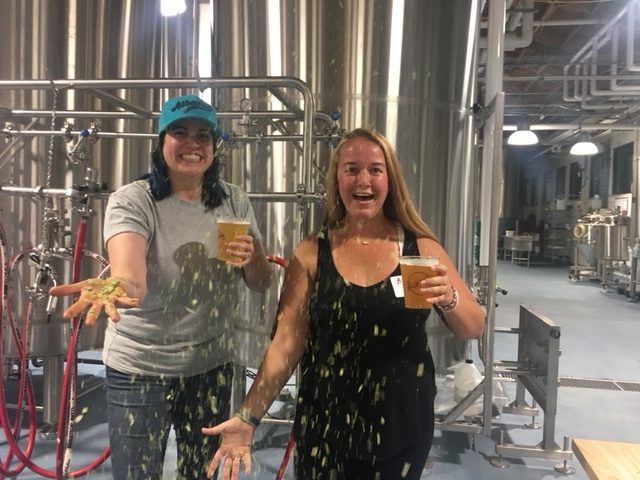 It is my deepest wish that I can be part of that impact for as many women as possible and that together, we can have a serious impact on the face of craft beer in North Carolina. I hope that other chapters will take on a project like this, and I’m happy to help with the process in any way that I can. Cheers! 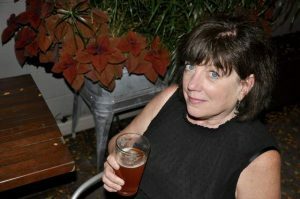 Btw: If you’d like to purchase a copy of Brewing Ambition, you can do so via this link: http://www.lulu.com/shop/anita-riley/brewing-ambition-recipes-stories-from-the-women-of-north-carolina-craft-beer/paperback/product-23114888.html. 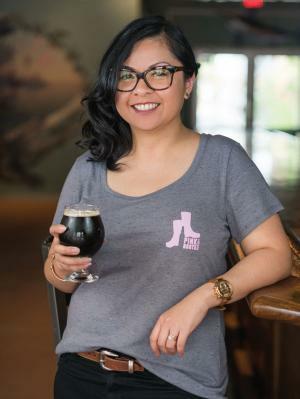 Anita Riley is the Cellar Operator at Mystery Brewing Company in Hillsborough, NC and the Pink Boots Society Representative for the Triad Region. 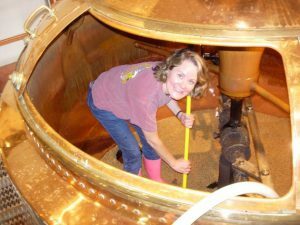 She is a Certified Beer Server Cicerone and studied Brewing, Distillation, and Fermentation at AB Tech in Asheville, NC as well as Rockingham Community College in Riedsville, NC. Her book Brewing Ambition benefits The Pink Boots Society’s Scholarship Fund which encourages, inspires, and assists women beer professionals to further their careers through education. Brewing Ambition can be found at Lulu.com. You can find her blog Brewing Up a Storm, which focuses on women in the beer industry at www.metrowinesasheville.com/brew-blog. Anita is a native to North Carolina. 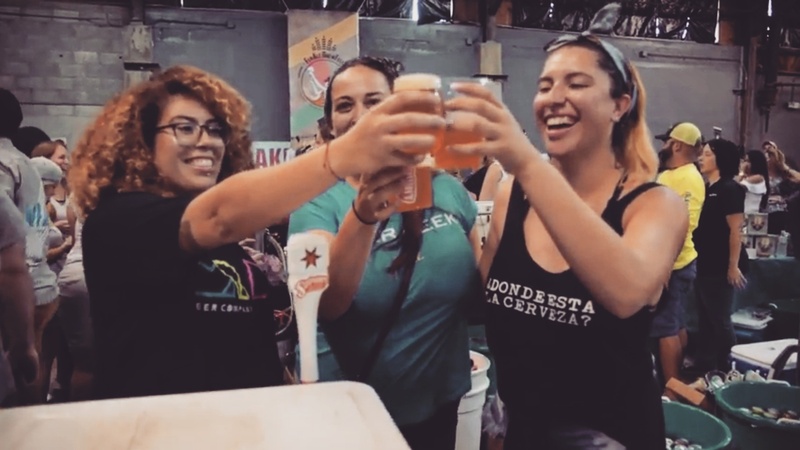 We are stoked for the Pink Boots Society 10th Anniversary Conference and Beer Festival (#PinkBoots10), taking place in San Diego June 2nd and 3rd. Megan Parisi, Head Brewer at the Samuel Adams Nanobrewery in Boston, MA, gives the keynote conference speech, then an intensive day of getting professional insights on Beer and the Business of Brewing from some of the leading women in our industry: Abby Heilbrun, Ska Brewing; Amy Newall-Large, Avery Brewing; Bess Dougherty, Grateful Gnome Brewery; Candace Moon, The Craft Beer Attorney; Gwen Conley, Cutwater Spirits; Ingrid Alvarez Cherney, Chicks for Beer; Joyce Turner, Mammoth Brewing Company/Mammoth Distributing; Julie Konileski, Boulder Beer; Karen Barnett, Small Bar; Kate Wallace, New Belgium Brewing Company; Kelly Lohrmeyer, Yakima Chief/Hopunion; Laura Lodge, Customized Craft Beer Programs; Mikaelaa Crist, @craftybeermaven; Nena Parks, White Labs; Nickie Pena, White Labs; Renee Johnson, Fort George Brewery; Rebecca Boyles, Beer Revolution; Susie Baggs, Brown Bag Beverage; Teri Fahrendorf, Great Western Malt, Founder, Pink Boots Society; Ting Su, Eagle Rock Bewery; Troy Bednick, Civil Life Brewing Company. If you are in town Thursday evening June 1, stop by ChuckAlek Biergarten for the Welcome Reception. For full deets and tickets, visit our dedicated website: http://10thanniversary.pinkbootssociety.org/. I just met up with a fellow Pink Boots Society member who has been so busy with her new business project that she just now noticed PBS is hosting a 10th Anniversary Conference & Beer Festival in San Diego, California June 2-3. Maybe you’ve been too busy to notice too? This is a big deal ladies! Big as in, PBS started when George W Bush was President. Big as in there were 1,480 breweries when PBS started. This year we’ll hit 6,000, or 4 times as many. Big as in, PBS has 50 Chapters in 10 Countries, with members all over the world. Major couch-surfing and collab brewing potential, if you work your membership right. Big as in, there has never been an all-women professional beer conference, never in the history of the world up till now. Combination packages are available for added savings. 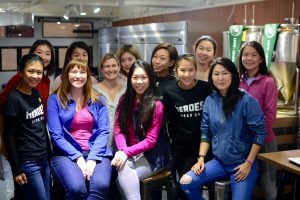 About my fellow PBS friend who was so busy with her new business project that she’d failed to see all the Facebook posts and e-newsletters about this amazing event? She’s going! You’ll want to meet her and the other attendees who are flying in from all over tarnation. Be there! I can’t wait to see you! Wow, wow, and wow! I have had the pleasure of reaching out to quite a few women who participated Big Boots Brew (BBB) Day 2017, a fundraiser that exemplifies the spirit of Pink Boots Society. The feedback has been inspiring. Many women traveled a fair distance; for some it was their first time assisting with a brew. 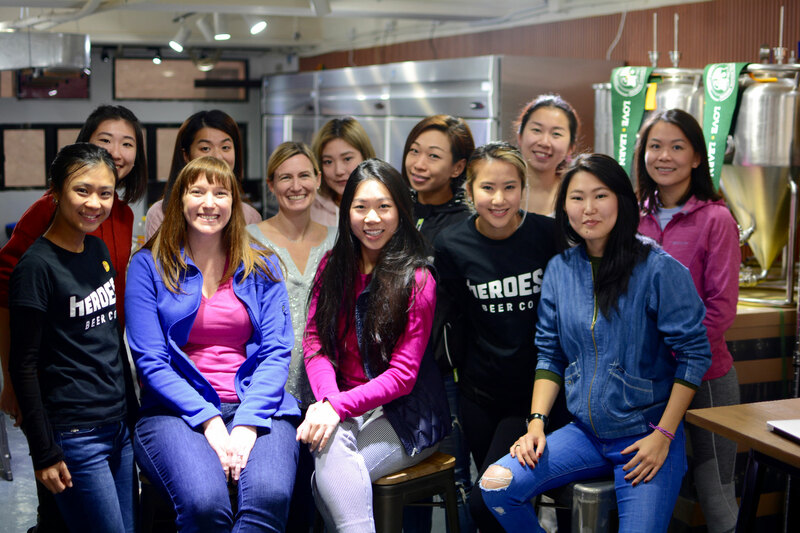 BBB2017 helped launched the Pink Boots Chapter in Hong Kong! 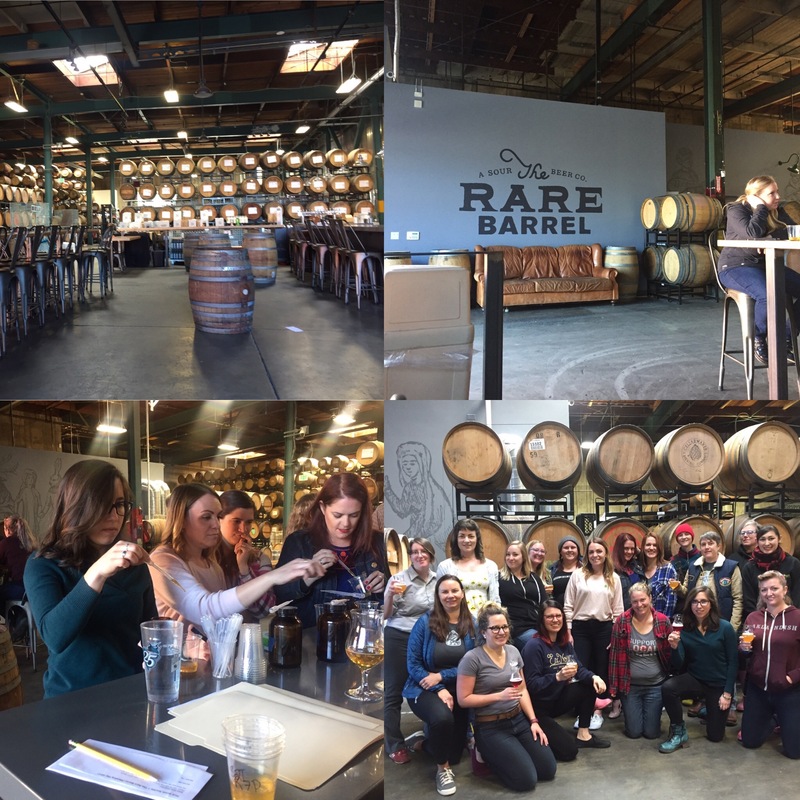 Overall, BBB2017 brought together women with diverse roles in the industry to celebrate our shared passion and community while brewing their own take on one style, Historical/Ancient Strong Ale. In anticipation of the upcoming release parties, it is my pleasure to share with you some of the comments that highlight the importance of this collective experience. Cheers to everyone who participated in BBB2017. It truly has been a wonderful and empowering experience, and I will eagerly await next year’s brew! In the meantime, don’t forget to try some of the awesome brews made this year. I know I will. With so many PBS chapters participating in BBB2017, there will be lots of release parties starting in April. Visit the PBS website calendar page to learn when and where they’re happening: https://www.pinkbootssociety.org/. 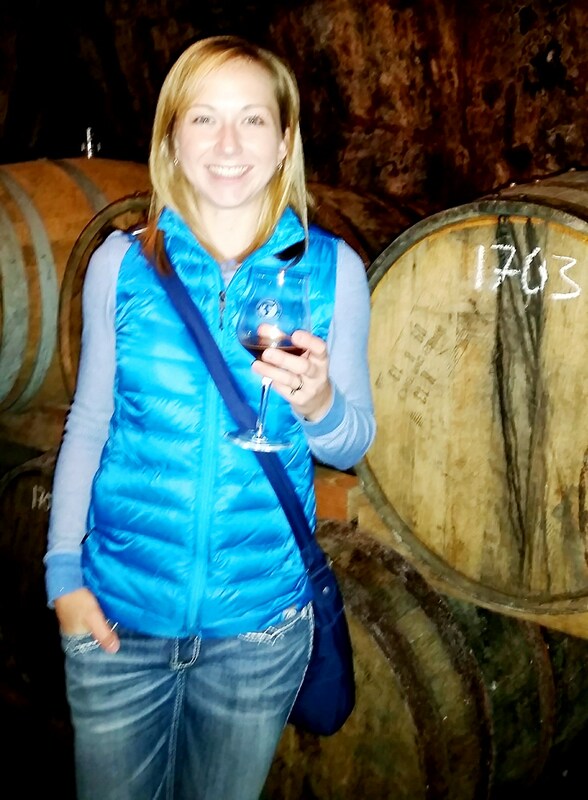 Amy Newell-Large is currently the Hospitality Manager at Avery Brewing Company in Boulder, CO. A Washington State native, She grew up in a home brewing family where IPAs reigned supreme. 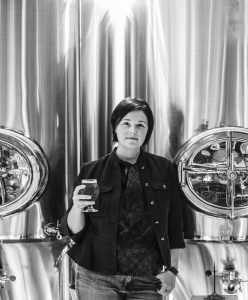 She has learned to be a jack-of-all trades in the beer industry, from bar tending to brewing, events and education. Amy received a PBS cultural immersion scholarship for the Germany Study Tour. She will be speaking on Tap Room Management at the upcoming PBS 10th Anniversary Conference.